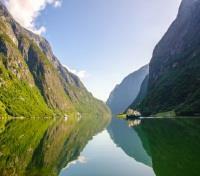 Discover Norway's impressive UNESCO-listed fjords on a boat safari. 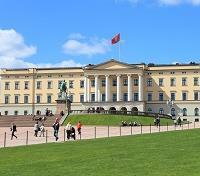 Private guided tours of Scandinavian capitals Helsinki, Stockholm, Oslo and Copenhagen. Food-based walking tour in Copenhagen with private guide. 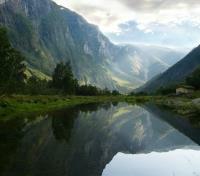 Take a spectacularly scenic ride on the world renowned Flåm Railway. From Helsinki to Copenhagen, explore the nation capitals of Scandinavia and magnificent fjords of Norway. 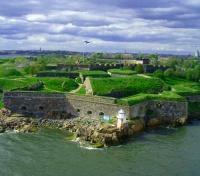 In Finland, tour Helsinki and the UNESCO World Heritage-listed Suomenlinna Fortress with a private guide. Take an overnight ferry crossing to Stockholm, Sweden's capital, discovering Hanseatic history in the Old Town, along with the Swedish Royal Family's impressive palaces. Upon reaching Norway, enjoy a private walking tour of Oslo's historic old town before embarking on a scenic rail ride on the world-renowned Flam Railway. Visit Bergen and bear witness to the majestic natural panoramas of the UNESCO World Heritage-listed Norwegian Fjords, then conclude your journey in Copenhagen, Denmark's stunning capital, a city annually celebrated as the world's most liveable city. Design, cuisine, culture, history and scenery - this is Scandinavia. Please note: this trip is recommended between June-September each year, in order to enjoy Bergen and the Norwegian fjords. Meet your private driver and vehicle for an airport transfer. For your added comfort, an English-speaking assistant will assist you at hotel check-in, walk you through your welcome package documents and itinerary, and answer any questions you may have. 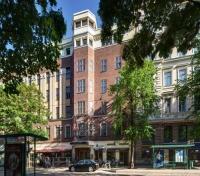 Located in the heart and center of Helsinki, Hotel Klaus K is the perfect modern design hotel. Inspired by the Finnish national epic Kalevala - nature and dramatic design flows into all interiors and each of the 171 guestrooms, customized for comfort, with cutting edge décor, and featuring all amenities for a pleasant stay. With an ideal location near shopping, galleries, museums, and key city sights, everything you desire is within walking distance. Without even stepping out the door, you can try the award winning Italian Toscanini restaurant and Klaus K Bar & Lounge, both options sure to keep you satisfied. Helsinki is one of Europe’s most modern and culturally progressive cities, yet it remains in touch with an intriguing history stretching back over 450 years. Meet your private guide and set out on foot for a walking tour of Helsinki, discovering the highlights of the city like Senate Square, the oldest part of central Helsinki, with the iconic bright white Helsinki Cathedral elevated above the surrounding Government Palace and University of Helsinki. 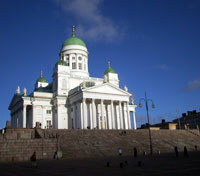 See the unique architecture of the Parliament House and Finlandia Hall, and admire the 19th century Uspenski Cathedral. When possible, you’ll also visit Temppeliaukion Church, also known as the Church of the Rock, with its interior walls comprised of the exposed natural bedrock which was excavated to supports its copper dome. Then, parting ways with your guide, you’ll board a ferry with direct service to Suomenlinna, a UNESCO World Heritage Site and island fortress, dating back to the 18th century. Upon arrival, you’ll be greeted by your private Fortress guide, to enjoy the beautiful nature of the island or explore the tunnels and Suomenlinna Museum. After about an hour, you’ll bid farewell to your guide and the island, as you board the return ferry for your return to Helsinki. Meet your private driver and vehicle for a port transfer. 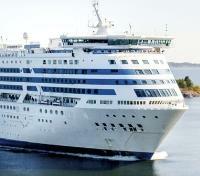 This evening you'll be sleeping at sea as you take a full-service overnight ferry across the Baltic Sea to Stockholm. The ferry, essentially a 2,500-passenger cruise ship, offers excellent facilities on board, including a choice of comfortable cabins, and award-winning restaurants for every taste from gourmet a la carte and grill houses, through buffet, to cafeterias and fast-food options. You'll also find a variety of entertainment including a casino, bars, nightclubs with live entertainment, a spa, boutique shopping, along with entertainment for children. Upon disembarkation, a private English-speaking assistant will be waiting for you at the port, holding a sign with your name on it. They will direct you to your awaiting private transfer, and accompany you to your hotel for check-in. Meet your private guide and driver, departing from your hotel on a half-day tour of Stockholm's 18th century Royal Palace and historic Old Town. 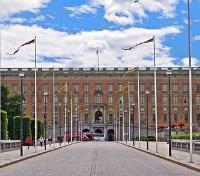 The Royal Palace, also known as the Stockholms Slott or Kungliga Slottet, is the official residence of the Swedish monarchy. The stunning palace has hundreds of rooms decorated in Baroque and Rococo style. See Queen Kristina's silver throne in the Hall of State, admire the beauty of the exquisite reception rooms, stroll between segments of the palace's five museums, and even revel in the royal costumes and armor in the Armory. 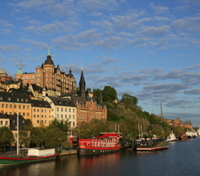 Afterward, spend some time exploring the charming Gamla Stan, Stockholm's medieval Old Town. Walk around and admire the lovely cathedrals and North German-style architecture of the surrounding buildings as you stroll the old cobblestone streets. Discover Stortget, Stockholm's oldest square, and Kopmangatan, the oldest street in the city, with history linking back to the city's 13th century founding. Miss Clara is a boutique design hotel in the heart of Stockholm, presiding in one of the city's most treasured Art Nouveau buildings. Originally home to Sweden's largest girls school, world famous architect Gert Wingårdh adapted the seven story building for remarkable hospitality, incorporating modern functionality with timeless design. The hotel’s 92 well-planned rooms and suites have a warm atmosphere, and stylish yet intimate expression. The on-site modern bistro offers classical dishes with a twist, while the green outdoor seating brings an urban picnic to life: summer friends and baguettes, cheese and charcuteries, fresh summer salads, lemonade and sangria. Miss Clara's superb location offers endless possibilities to explore the many great restaurants, exciting bars, shopping gems, and hidden corners of this great capital. Meet your private guide and driver, and depart on a half-day tour to the 17th century Drottningholm Palace, a UNESCO World Heritage Site, and the private residence of the Swedish royal family. The crown jewel among Swedish palaces, the beautiful Drottningholm is located 7 miles west of Stockholm on Lovö Island in Lake Mälaren. "Versailles in miniature", is an oft-used epithet for this former summer residence. The palace boasts magnificent suites from the 17th to 19th centuries, extensive parks, its own theater and a Chinese pavilion. The Drottningholm Court Theater is a unique attraction with its original scenery, 200-year old stage machinery and interior decoration virtually untouched by the passage of time. 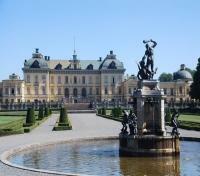 Take in lavish luxury and majestic beauty today as you discover the palace of the Swedish royals. Meet your private driver and vehicle for a train station transfer. Depart by train from Stockholm to Oslo. Approximate travel time is 5 hours. 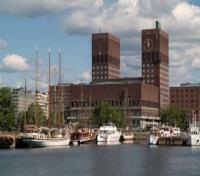 Take a short, self-guided walking transfer to the Oslo Central Train Station, located two minutes from your hotel. 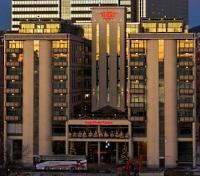 Thon Hotel Opera is located close to the Airport Express Train Terminal at Oslo Central Station, and offers fabulous views of Oslo Fjord and the new Opera house in Oslo. Guestrooms are comfortable and spacious, featuring all the amenities needed for a comfortable stay. Dine at Scala Restaurant, which offers International cuisine in modern surroundings, or check out Tosca Bar for freshly ground coffee and cocktails in a relaxing atmosphere. A fitness center is available for guests use within the hotel. For your added comfort, your luggage will be picked up at your hotel in Oslo and safely transferred to your upcoming hotel in Bergen. With luggage being taken care of, you can sit back and enjoy your train journey hassle-free, taking in the breathtaking views along the way. Transfer from Oslo to Flam today by train, with a connection in Myrdal. The Bergen Railway is a unique experience on Northern Europe's highest-altitude railway line. One of the greatest challenges is the harsh and quickly changing weather. The line is exposed to deep low-pressure centers from the west, which can mean strong winds and heavy snow for part of the year. Keeping the railway open demands great effort and technical expertise. Today, skilled workers, effective equipment, tunnels and snow tunnels make the Bergen Railway one of the safest and most comfortable ways of travelling between Oslo and Bergen. The line is consistently ranked among the top rail experiences in the world. Four stops before the end of the line in Bergen, you'll disembark in Myrdal. In Myrdal, board a cogwheel train to Flam on the Flam Railway. The scenic 12-mile route between Myrdal and Flam is one of the steepest non-rack railway tracks in the world and provides some of Norway's wildest and most magnificent scenery. On the ride you can see rivers that cut through deep ravines, waterfalls cascade down the side of steep, snow-capped mountains, and mountain farms cling dizzily to sheer slopes. There are also a few spirals along the route which allow trains to rise on a steady curve until it has completed a loop, passing over itself as it gains height, allowing the railway to gain vertical elevation in a relatively short distance. Take a short, self-guided walking transfer. Hotels in Flam are all located within just a few minutes of the Train Station. Setting out from the pier on a small, specially-designed RIB boat, your captain and guide will take you and a small group of participants on a picturesque fjord safari up the Aurlandsfjord and into the Nærøyfjord, which makes up part of the West Norwegian Fjords UNESCO World Heritage Site. Cruise toward Gudvangen at the end of the fjord, using Bakka Stray as your turning point. This is the narrowest part of the fjord where the dramatic cliffsides converge, creating an ever impressive stretch of scenery. You'll head back to Flam on the other side of the fjord for a different view, stopping along the way to admire the scenery, looking to spot seals, porpoises, and eagles. Hear about the fjord, local history, and the wildlife, along with tales, and legends, from various places of interest. 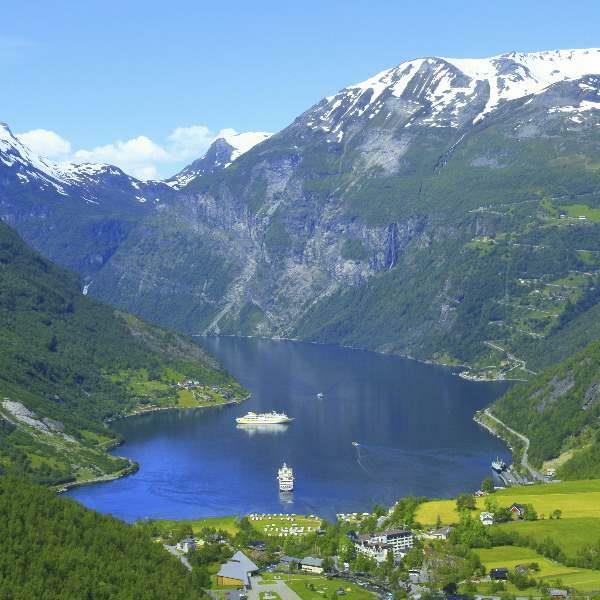 At Undredal, you'll go ashore to enjoy this little village squeezed in between a tall mountain. Inhabited by 65 people and almost 500 goats, it's no surprise that the specialty of this village is the production of goat cheese, which you'll get to sample at a local cafe! You will also hear about the tradition of cheese production, and you listen to folktales and folk songs before returning to Flam. Enjoy an included dinner this evening at Fretheim Hotel. The hotel restaurant, Arven, has a view looking straight toward the fjord, and locally-sourced ingredients is at the heart of its cuisine, which is only natural when some of the best producers of cheese, meat, fruits and vegetables are right outside the door! Dating back to the 1870's, Fretheim Hotel is a beautiful white timber building situated in Flam, at the head of a scenic arm of the famous Sognefjord. In the historic wing of the hotel, every effort has been made to preserve the old feel of the hotel – in fact it appears much the same now as when it greeted travelers in the 19th century. All 122 comfortable guestrooms offer views of the hiking trails and mountains surrounding the property, or the beautiful fjord. Dine at the hotel’s restaurant, which prides itself on serving locally grown and raised ingredients, while offering views looking straight towards the fjord. Visit the lobby bar to relax with a cocktail, or visit the coffee bar to enjoy a coffee in the garden. Take a short, self-guided walking transfer. Hotels in Flam are all located within just a few minutes of the Port. Enjoy the incredible scenery of your boat ride from Flam to Bergen, passing through Sognefjord, Norway's largest and deepest fjord. Cruise past the entrance to the UNESCO World Heritage-listed Naeroyfjord, catching glimpses of what's considered the world's number one natural heritage site by the National Geographic Society. The total journey will take approximately 5.5 hrs. 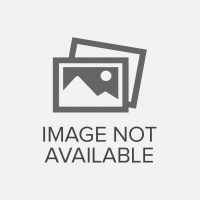 Take a short, self-guided walking transfer. Your hotel is located within just a few minutes of the Port. The Clarion Hotel Admiral is housed in a magnificent, century-old pack house building in the heart of Bergen. 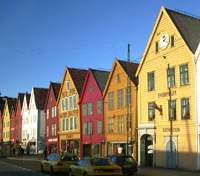 Located at the harbor's edge, it has a fantastic view of the Hanseatic buildings of the UNESCO World Heritage-listed Bryggen, the scenic mountains, and the lively fish market. The 270-degree sea view provides a true maritime ambiance. Featuring 210 modern and comfortable guestrooms, Clarion Hotel Admiral strives for personal service and a real presence for all guests, recognizing these as the cornerstones for a pleasant stay. The hotel’s restaurant, Kitchen & Table, features a seasonal menu full of international and Scandinavian flavors, combined with local ingredients. 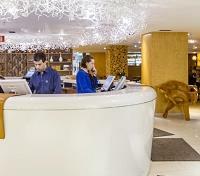 Stay connected with free wifi internet access in all areas of the hotel. 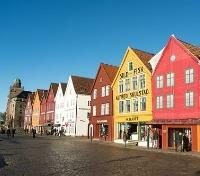 Board a flight in Bergen with direct service to Copenhagen. Approximate flight time is 1.5 hours. In the company of a private guide and driver, enjoy an airport transfer combined with a panoramic city tour of Copenhagen. 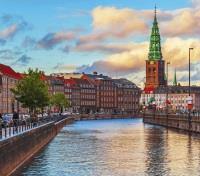 Consistently ranked as the world's most liveable city, Copenhagen is laced with stunning Danish design, cutting edge Nordic cuisine, quaint and colorful historic buildings, and a jovial, laid-back local lifestyle. Admire the city’s must-see sights and monuments, like the 18th century Christiansborg Palace, home to the Danish Parliament, the Old Stock Exchange building – one of the oldest in Copenhagen, and Kongens Nytorv, where you can see the renowned Royal Theater – host of the Royal Ballet. Take in Nyhavn, the 17th century waterfront and canal, lined with colorful townhouses, many of which house modern cafes and restaurants, then bear witness to the 18th century rococo Amalienborg Palace resides, residence of the Danish royal family. Pass by Copenhagen's inner-city amusement park, Tivoli Gardens, and make a visit to the Gefion Fountain and the Little Mermaid statue, inspired by famous Dutch author H.C. Andersens fairytale. 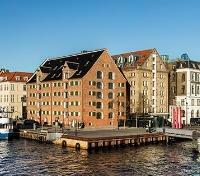 With a fantastic atmosphere and unique location at the last frontier in Nyhavn Canal, 71 Nyhavn Hotel is at home in two newly renovated warehouse buildings from the early 1800's. 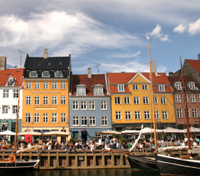 For 200 years, Nyhavn 71 has been located between the foamy sprays from the harbor, and life along the Nyhavn Canal. From the southern side of the building, unparalleled views to the many beautiful museum ships and the clucking water await you. The hotel's two warehouses, home to 130 guestrooms in total, have undergone a sweeping transformation with focus on welcoming interiors, a timeless, Scandinavian look, and a humble respect for the warehouses’ souls and charm which add character to the modern hotel ambience. After a day of discovery, why not top it off with a delightful dining experience at the new on-site gourmet restaurant. Setting out on foot with a private guide, explore the tastes of Copenhagen on a half-day, food-based walking tour, with a number of included tastings. 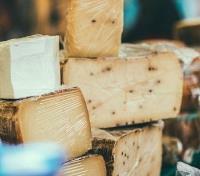 Starting at Torvehallerne, the new covered market halls, you’ll sample artisan cheese, developed in collaboration with the city’s Michelin-starred chefs. Try liquorice, caramels and preserves from some of the most interesting small-scale local producers. You’ll explore the city, wander through Copenhagen Botanical Gardens, and relax in the beautiful green surroundings – all while talking about produce and local foods. Over the course of your tour, you’ll pass several of the city’s greatest landmarks and get to discuss its history, food being the overarching focus. Try smørrebrød, an open-faced sandwich, sample three different types of beer at a microbrewery, and even a gourmet hotdog, a reworked classic of the Copenhagen street food scene. Conclude back at Torvehallerne, where you’ll have a chance to explore further on your own, not to mention do some shopping - so best to leave yourself plenty of time to explore the city and its food after the tour. Please note, tastings may vary according to season and supply. Depart from the International Airport. End of itinerary.